The IEA report identifies key obstacles hydrogen must be overcome to play a larger role in the energy system, including the efficiency and cost of electrolyzers and fuel cells, building networks and infrastructure for different scale operations, and the cost of production from very-low carbon sources with complementary storage capabilities. The focus of this Research Review is advances and challenges in production methods and their cost at scale in obtaining hydrogen from water. Civilization runs on energy for transport of people and things, food production, heating and cooling, communication, and the manufacturing of goods. The centuries-old industrial age still rides on fossil fuels aided in part by hydropower and more recently nuclear energy. Even with recent advances and contributions of wind and solar energy, fossil fuels drive over 80 percent of the global energy system. Yet the byproducts of this 200-year juggernaut carbon dioxide emissions, acid deposition, heavy metals, volatile organic compounds, and particulate pollution, resulting in the alteration of ecosystems, human health, the atmosphere and ocean, and climate change (Chu et al 2016). A sustainable energy system to in drive the long-haul needs of civilization demands a set of attributes – sources of energy need to be clean, reliable, flexible, safe, affordable, and abundant. Energy transitions take time, but the estimated remaining carbon budget of about 232 billion tonnes of carbon (Obersteiner et al. 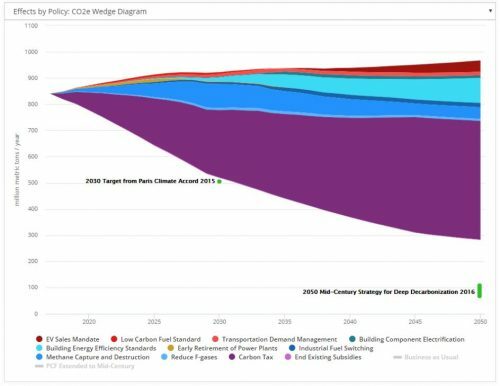 2018) dictated to avoid exceeding the dangerous 2°C warming threshold requires a very aggressive cascade down to near net zero emissions this century – all while satisfying every energy sector’s needs. This amounts to a reduction in today’s annual emissions of about 10 billion tonnes of carbon in the form of carbon dioxide to near zero in six to eight decades. While this sounds daunting – more of an energy revolution than transition – it is doable with technologies and approaches that stay within the carbon budget. Ideas about the potential role for hydrogen are not new, particularly stimulated by the oil crisis of the 1970’s, but they are closer to being realized given near grid parity of renewables offering a clean, low-cost electricity source, combined with advances in production and storage of hydrogen. As countries grapple with how to rapidly decarbonize their energy systems, a new level of interest is growing for the role hydrogen can play given its extraordinary versatility as an energy carrier, feedstock for synfuels and fertilizer, a fuel itself, and a source of dispatchable electricity via storage and fuel cells. Production is a hurdle to realizing the potential of hydrogen as a clean energy carrier. Currently, about 95 percent of hydrogen is produced from fossil fuels – about half of that from natural gas with steam methane reforming (SMR), and the rest from refinery gas and coal (Moliner et al 2016). However, the full domain of feedstocks or inputs for the production of hydrogen is broader than from fossil sources including algae, biogas, alcohols, power + water, high temperature + water, and pyrolysis of wood. The focus here is on how to liberate hydrogen from water using sunlight. 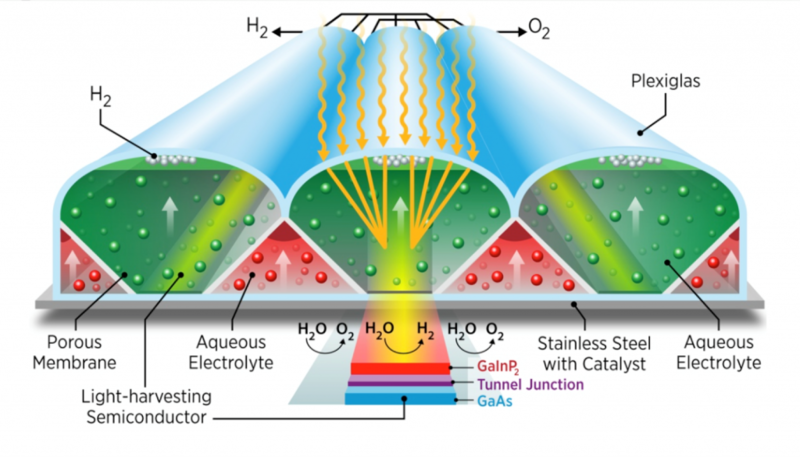 Photoelectrochemical (PEC) cells utilize sunlight to split water liberating oxygen and hydrogen in one integrated system. From Lewis 2016. Recent research by Shaner et al. 2016 reports on two solar-to-hydrogen processes with an emphasis on component cost, balance of system, and projected cost when scaled to 10,000 kilograms (kg) H2 per day. 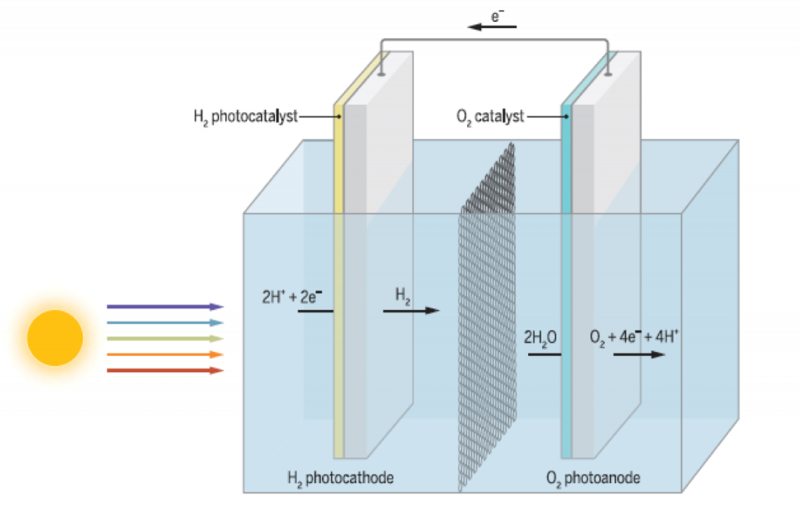 The two approaches explored by Shaner’s team are photoelectrochemical (PEC) and photovoltaic electrolysis (PE-V). The PEC process utilizes photon energy to directly split water molecules to produce hydrogen combining the solar and electrolysis components in one integrated module (Figure 1). The PV-E system produces electricity via a photovoltaic cell that then drives an external electrolyzer to produce hydrogen. One price difference they found in the installed cost of the two system is the cost savings between piping H2 from the PEC module to storage or direct application versus in the PV-E system, where the need to run wires from the PV installation to power conditioning equipment and then more wires to the electrolyzer – wires cost more than pipes. Two PEC approach types were considered by Shaner’s team: one utilizing 10x concentrating solar, and the other 1x solar. They also consider two types of PV-E systems: one powered exclusively with solar, and one with solar supplemented by grid electricity. The PEC and PV-E systems in the study were compared to a benchmark system using a proton exchange membrane (PEM) electrolyzer connected to the grid. The benchmark PEM system was rated at 61 percent efficiency, and $0.07 per kilowatt-hour electricity for a levelized cost of hydrogen (LCH) of $5.50 per kg H2. As a point of comparison, the commercial cost of hydrogen from natural gas steam methane reforming (SRM) is about $1.39 per kg H2 (assuming a price of natural gas at $3 per million BTUs). A DOE/NREL prototype PEC design for a 10x concentrating lens system combined with innovative electrolyte and catalysts (Deutsch & Turner 2014). 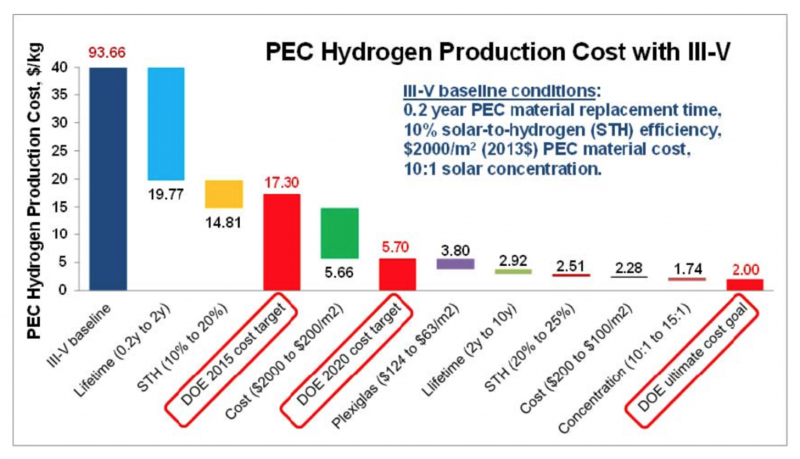 The Shaner analysis shows the PEC base case (1x solar at 9.8 percent efficiency) yielded a LCH of $11.4 per kg H2, and the PV-E base case (no grid assist, 9.8 percent efficiency) had a LCH of $12.1 per kg H2. The PEC with10x solar and 20 percent efficiency had a LCH of $9.2 per kg H2, and the PV-E with grid assist a LCH of $6.1 per kg H2. These results for solar hydrogen are about a factor of two above the benchmark PEM system that uses grid electricity to produce H2, and a factor of about seven more costly than H2 produced via natural gas SMR (Table 1). The authors concluded that a price on carbon equivalent to about $800 per tonne of CO2 would be required to make the base case PEC hydrogen cost-competitive with SRM H2 with a LCH of $1.39 given today’s state of PEC development (Shaner et al 2016). Given the cost and technical barriers to advancing PEC technology along with the desire to increase energy security, the National Renewable Energy Laboratory (NREL) created a R&D program for PEC technology to bring down the cost of hydrogen from solar to about $5.70 by 2020 and $2 per kg H2 at an unspecified time in the future (Deutsch & Turner 2014). The following figure shows the timeline and advances needed to achieve this goal with initial advances made by improving the lifetime of the critical materials and improving the solar to H2 efficiency from 10 percent to 20 percent or better. Although the NREL target results in a cost-competitive price for solar-derived hydrogen, an argument can be made that ample opportunity exists to pursue other avenues of deployment that utilize more conventional hydrogen production, as well as further develop storage and distribution technologies and approaches, in the time between now and the result of these R&D efforts These gains will be invaluable as lower-carbon approaches to hydrogen production become more mature. Moliner et al (2016) echoes this thought and cites a study for the state of California by Yang and Ogden where a hydrogen transportation system by 2050 could be realized by a prudent combination of hydrogen from fossil sources with carbon capture and storage (CCS), biomass, and renewables. While it is important to continue R&D of hydrogen production from renewables, much can be learned by scaling the use of hydrogen where it already has some traction, for example in the continued development and deployment of fuel cell-based electric vehicles (FCEV). It is too early to appreciate the role hydrogen will play as the century unfolds. There will be cases where it competes – for example in the marketplace as consumers and fleet operators weigh the advantages of EV and FCEV – and places where it may complement or enhance such as using overcapacity in renewable production stored as H2. Chu, S., et al. (2016). “The path towards sustainable energy.” Nature Materials 16: 16. 2014 U.S. DOE Hydrogen & Fuel Cells Program Review (Project ID: PD035) slide deck presentation June 18th, 2014. IEA (2015). Technology Roadmap: Hydrogen and Fuel Cells. Energy Technology Perspectives. France, International Energy Administration. Lewis, N. S. (2016). “Research opportunities to advance solar energy utilization.” Science 351(6271). Moliner, R., et al. (2016). “Analysis of the strategies for bridging the gap towards the Hydrogen Economy.” International Journal of Hydrogen Energy 41(43): 19500-19508. Obersteiner, M., et al. (2018). “How to spend a dwindling greenhouse gas budget.” Nature Climate Change 8(1): 7-10. Shaner, M. R., et al. (2016). “A comparative technoeconomic analysis of renewable hydrogen production using solar energy.” Energy & Environmental Science 9(7): 2354-2371. Enter your email address to have updates from Energy Innovation delivered to your inbox. The Canada Energy Policy Simulator analyzes Canada’s commitment to the Paris Climate Accord and potential reductions under the Pan-Canadian Framework. The results show Canada will miss its commitment, but extending PCF policies can approach the Paris goal while saving money and lives. @AmyAHarder @UChiEnergy You might want to triangulate your sources. This study is riddled with errors. Receive monthly insights and updates notes from CEO Hal Harvey straight to your inbox. SIGN UP today! © 2019 Energy Innovation. All Rights Reserved.